Why do US « Experts » Who Supported the « Moderate » Al Qaeda Terrorists Suddenly Find Syrian Rebel Sectarianism « Extraordinary »? Anti-Assad luminaries in the United States suddenly play surprised that their beloved « moderate » insurgents are a bunch of racist and sectarian head choppers. But this was obvious as even the very first demonstration against the Syrian government in March/April 2011 were driven by sectarianism. Countless members of minorities in Syria have since been murdered by « western » and Gulf supported « moderate rebels ». Why do these anti-Syrian « experts », who supported the genocidal insurgents, suddenly find that abhorrent? The « moderate rebels » and al-Qaeda in Syria currently attack the government held parts of the city of Aleppo. Part of their attack plan is the storming of the Artillery Academy in Ramouseh district. The academy was the scene of mass murder in the 1979-1982 Muslim Brotherhood uprising against the government. The name they chose for the battle make their intentions clear. 2:00am · 5 Aug 2016 – Hala Jaber @HalaJaberRecap: Former #AQ#Nusra now moderate #Jabhat_Fath_alSham, name 3rd phase of liberating Aleppo after Ibrahim_al_Yussuf, who they deem a hero. .2/ They deem #Ibrahim_al_Yussuf, a hero, for separating Sunnis 4rm #Alawites & apostates & executing 80 Alawites of them, in 1979. .3/ That incident took place in Aleppo’s artillery school then. Now JFS/JAS is promising 2 « conquer » same artillery school & kill Alawites. .5/ This all in the name of phase three of the « blessed battle »to conquer » #Aleppo. 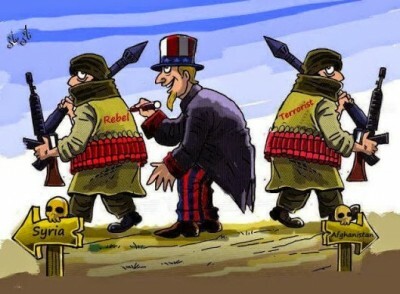 The bloody sectarian name for the battle is promoted not only by al-Qaeda under its sham new name but by all U.S. supported « moderates » who take part in it. The political leader of the U.S. supported Zinki group, members of which recently beheaded a sick child, is a near relative of Ibrahim al Yussuf. The Muslim Brotherhood insurgency in Syria between 1979 and 1982, of which al Yussuf was part, was a series of bloody guerilla attacks and mass murder incidents against the state and minorities. It finally ended when the government trapped the leadership and many militants in the city of Hama and fought them down in a bloody urban battle. Many members of the militant cadre of the movement fled to foreign countries. Some came back to reignite their killing spree when the protests in Syria started in 2011. For those who have been watching the developments in Syria the sectarian motive of the insurgents is certainly no surprise at all. But here are two U.S. « experts » who suddenly find them « extraordinary ». Robert Ford was U.S. ambassador to Syria from 2011 to 2014 and one of instigators of the protests against the Syrian government. He has since feverishly argued for more weapons for the insurgents and for U.S. bombing to destroy the Syrian government and the country. 1:27 PM – 4 Aug 2016 – Robert Ford @fordrs58If oppo fighters’ goal n #Syria now 2 separate Alawi citizens &kill them, then the fighters don’t merit outside help. Up to them 2 clarify. Tricky indeed, but she « has to » do it. Right? « Extraordinary » in this is only that these « experts » suddenly find something surprising that has been central to the insurgency from its very beginning. [I]nside Syria those chanting “Christians to Beirut, Alawites to their graves!” have become more than a fringe element. Human Rights Watch and other groups have documented cases of rebels executing Syrian soldiers and Alawites regarded as government collaborators. Here is video from the early March 2011 protests in Syria. They were clearly sectarian with the protesters loudly threatening to kill minorities. What was so difficult to understand with « Alawis to the coffins » and other genocidal « revolutionary » slogans and deeds that Ford and Landis did not comprehend them throughout the last years? What has changed that Landis and Ford now act surprised about the « extraordinary » sectarianism of the insurgencies they supported and still support?